The right time to buy farm equipment. Whether you should buy new or used. Why you may want to sell farm products wholesale. How to set wholesale pricing for your farm products. Why pricing your farm products solely based on your production cost may be a big mistake. How to tell the difference between equipment you really need vs. equipment you want. I started taking listener questions for my podcast and I’ve got a number already. I’m going to cover three of those questions today. If you’d like to submit a written or recorded question for the podcast, just head over to smallfarmnation.com/question and ask away. Ask any question related to marketing your farm business or running your farm business and I’ll try to help you out. 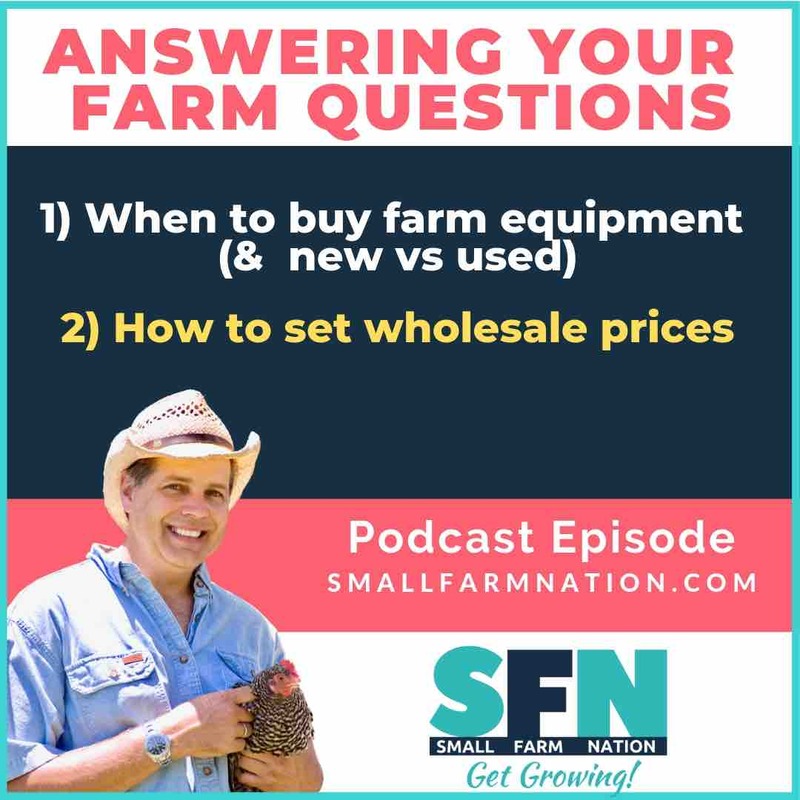 Hey farmers you’ve got questions about marketing and managing your farm business, right?Today, I’ll answer listener questions about when to buy farm equipment, when to buy new versus used and how to set wholesale prices for farm products! Hey there, thanks for joining me again this week. So, I started taking listener questions for my podcast and I’ve got a number already. I’m going to cover three of those questions today. If you’d like to submit a written or recorded question for the podcast, just head over to smallfarmnation.com/question and ask away. 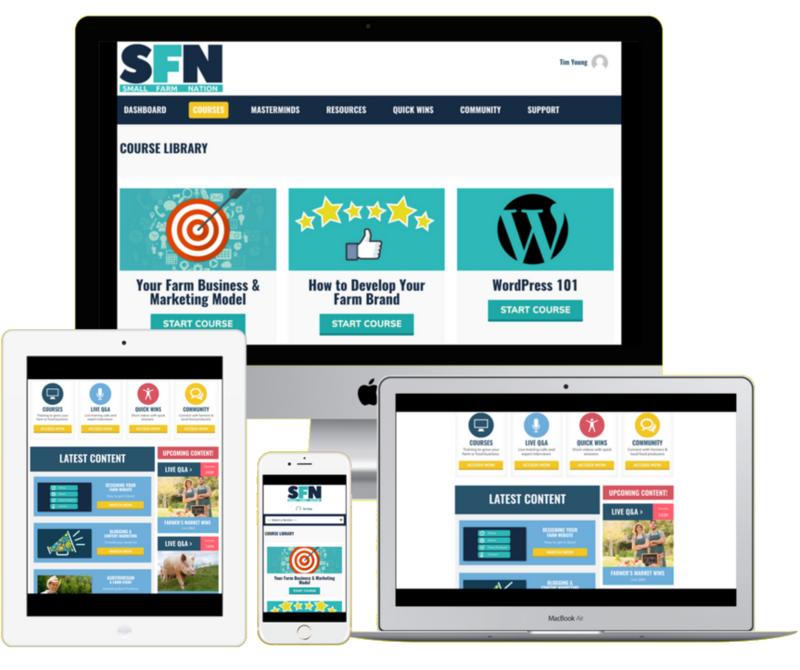 Ask any question related to marketing your farm business or running your farm business and I’ll try to help you out. Okay, this week I’ve got three questions to tackle. The first is from Coby in Florida, who hasn’t started his farm yet. But he has been a Small Farm Nation Academy member since the doors opened and is taking steps to set his farm up for success. 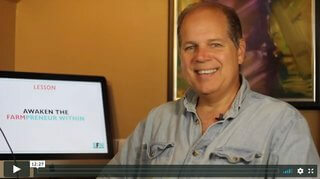 Coby’s two-part question is, should you buy new or used equipment for your farm business? And, is there a rule of thumb on when you should invest in a piece of equipment? So, I’d like to start with that second question. When should you invest in a piece of equipment. I’m tempted to say put it off as long as possible. But sometimes that’s not good advice. Here’s an example. When I first bought our property back in 2006 one of the first things I did was purchase three used 40’ cotton wagons. I got them for like $400 each, which was a heck of a bargain. Now, I didn’t even have any livestock at the time, but we planned to start a pastured poultry business the following year with laying hens following our grassfed beef herd. So, when I saw the opportunity to snag those trailers I grabbed them, parked them on the property and began retrofitting them into eggmobiles. There are countless examples like this where you want to be an opportunistic purchaser. And, Coby, you’ll see as I talk here how your two questions will intertwine…when to buy equipment and whether you should buy new or used. In this case my “when” was early because these are hard to find, so I needed to make sure I’d have one. And I bought used because that was the best way for us to create a functional 400-hen eggmobile at a minimal cost. Now, that “minimal cost” issue is critical. Here’s why. Weather isn’t likely to cause your farm to fail. Animal or crop losses isn’t likely to either. What IS likely to cause your farm to fail is running out of cash. Cash flow management is critical in any business, so preserving cash has to be your primary consideration when making your purchasing decisions. So two things I’d think about when considering when to buy a piece of new OR used farm equipment is, 1) the impact on cash flow, and 2) is the equipment absolutely critical to the business. In other words, can I farm without it and still generate expected income. In my eggmobile example the answer was I needed that equipment for the business. But I didn’t need new so I sourced used and retrofitted. But there are other examples where I made “rationalized” purchases. For instance, I bought two John Deere Gators for my farm. I bought them both used at farm auctions. Now, I considered those Gators to be super handy on the farm, especially since I had apprentices using them to haul feed around, move eggmobiles and so on. But did I really NEED those purchases? Really? No. Because I had a four-wheel drive truck, an F-150, that was perfectly capable of hauling feed, moving eggmobiles and so on. So why’d I buy the Gators? Because I had the money to and wanted the convenience. I borderline needed them because I used my truck to haul livestock to processors or make deliveries while others tended to farm chores. But could I have farmed without the Gators and produced the same income? Yes. So there are two examples of when I bought used equipment. One that was a “real” necessity and two that weren’t. And I say “real” because, let’s be honest, we all rationalize purchases. All the time. But, back to farming, this issue of whether to buy new or used can be tricky. Because since we want to preserve cash, sometimes new may make more sense. For example, let’s say you determine you absolutely must have a tractor. And let’s say you could purchase a two year old New Holland Workmaster 60 horsepower tractor, with loader, with only 200 hours on it. But, as a private sale, it will set you back $22,000 cash. Alternatively, you could buy a brand new one of the same type with no hours and take advantage of low seven-year financing. That would lock you into, say, $375/month. Clearly you’ll pay much more for the new tractor over seven years. But you keep the twenty two grand in your bank account and, instead, focus on servicing the $375/month in debt each month. So, no, I’m not going to tell you what to do here, Coby. Because as you can see this gets into so many variables that I don’t know about you. But you do need to look closely at, A) what you really need vs what you want, and B), your financial resources. Okay, let’s take another example. Let’s say you’ve determined you really need a piece of equipment. Say, you’re a farmstead cheesemaker. Do you need a stainless, jacketed cheese vat? Yep, you sure do. I bought my vat brand new when I started making cheese. But would I do that today if starting over? No, not if I had the cash to buy a used vat. Because you can get used vats and lots of other dairy equipment pretty dang cheap—at least compared to new—online. I gave links to all kinds of amazing deals for this stuff in my online course, How to Start an Artisan Cheese business. It’s at startacheesebusiness.com, or the course is included free inside the Small Farm Nation Academy. So in that case I’d definitely buy used. As to the other part of your question, Coby, when should you buy it. I’d buy that vat early in the set-up process of my cheese operation, because so many other things depend on it. And the inspectors are going to need to see it set up before I get approval. So certain things like that need to be bought well before you have any chance of earning a dime. Conversely, could I get away not taking delivery of my hog feeder until the week my hogs arrive? Sure. Not saying you should, but you definitely could. Clearly there’s a lot to consider with your two-part question, and I haven’t even touched on other variables such as likely repair and maintenance considerations of new vs used. Each farming enterprise is different, so you’ll need to continually assess what you truly need to generate profitable income. And always keep cash flow as priority one. Failure to do so will kill your business. Of course, since you’re a Small Farm Nation Academy member, you can open a private coaching thread with me anytime you want and we can go through any opportunities and decisions you’d like. Great question and I know a number of farmers struggle with this issue. I see questions all the time along the lines of how much should I discount when selling wholesale, how should I price my products for restaurants and retailers, and so on. Why do you want to sell wholesale? At least in part, the answer to this question will help you determine the answer to what you should price it at. Now you may be thinking it has nothing to do with it. After all, a logical answer to James’s question would be to just set his prices at a pint that is sufficiently profitable for his farm. And to do that he’d have to fully understand his cost of goods sold and his gross profit margins. So, sure, telling him to price it at a profit is a logical response. But, as you’ll see in a second, there’s more to the pricing equation than that. If you just price it based on your own numbers you may leave money on the table. Because this is cost-based pricing. The alternative to that is value-based pricing, which is why we pay a grand for an iPhone that costs nowhere near that to produce. So you may be producing a product that has a lot of market value, so you’ll not want to discount that. But first, I still want you to be crystal clear on why you want to sell wholesale. Is it because you’re looking for convenience? In other words, you’d rather sell 50 chickens to one customer than one chicken each to 50 customers? Is it because you want the marketing cachet’ of being in a specific restaurant or at a retailer? If so, why, and what will that cachet’ get you? A couple of months ago I had Paul from Pasturebird on the show and he talked about the Los Angeles Lakers being his first wholesale client. That cachet’ quickly caught the attention of the Los Angeles Dodgers who then became a client, and Paul’s wholesale business took off from there. So sometimes marketing cachet’ is a great reason to serve a keystone wholesale client. Is it because you don’t have inventory space and want to take chickens straight from the field to processing to the buyer, without having to invest in freezers? Whatever the reason, make sure you know why you want to sell wholesale in the first place. But let’s assume it’s the convenience factor—that you’d rather deal with a fewer number of customers directly so that you can expand your business. In this case you’re trading the burden for servicing lots of customers for convenience and cost savings. Now you can deliver to one location instead of delivering to many drop sites, farmers markets or keeping a farm store open. Fair enough, good reason. So how do you set your price? Here are things to consider. First, you do absolutely have to have a firm grasp on your costs. What does it cost you, all-in, to produce a chicken, in this example? And when I say “all-in,” I mean not just your direct cost of goods sold, but allocating fixed overhead, depreciation and amortization as best you can. Once you know that you should determine what is your retail price. I want you to determine this based on, at least, two factors. A) your all-in costs PLUS your necessary profit margin, and B) market prices for competitive products. You’ll need to define what competitive products are. But if you’re producing organic, pasture-raised chicken then your competitive product is not the cheapest chicken from Wal-Mart. It’s likely at Whole Foods, Earth Fare, a co-op or another natural food store. These are your competitive products and this is likely where your target customers shop. Given those two variables you can establish your retail price. For the sake of this discussion, let’s say you price your non-GMO pastured chicken at $6.00 per pound. If that seems high to you do a quick Google search on “non-gmo pastured whole chicken price” and look for yourself. Often you’ll see it at well over $7.00 per pound. Regardless, set your retail price. Ideally, it should be at least double your all-in production cost. Why? Because—and trust me on this one—you’re going to need that ample profit margin to deal with all kinds of uncertainties in your small business. There are plenty of bad times, and the way we survive them is to have a financial cushion. If your margins are too thin you’re not gonna make it. As for me, when I produced farmstead cheese I set my retail price at $28.00/lb. Kroger, Whole Foods and Earthfare all charged a bit more than that for mine and similar raw-milk aged cheeses so that price made sense. And I made the price pretty close to that at my farm store, because otherwise I’d be undermining my retailers. And that’s something you’ll want to be careful about. It’s tempting to want to offer the lowest price at your farm. But if you’re committing to a wholesale model you don’t want to undermine your retailers. So think it through and be careful. Okay. On one end of the spectrum you have your retail price. On the other end you have your all-in costs to produce each unit. Clearly at the retail price you’re making good money—quite a bit more than what your minimum profit requirement is. If you’re not, you’ve got a problem with your retail price or your production costs. Now you gotta determine what minimum price you need for your product that will meet your profit requirements. Not what retail price you need—we already know that. What minimum price you need. This lowest price will form the bottom of your wholesale pricing structure. And you likely wouldn’t want to go here unless there was a very compelling reason. So now you know three things. You know your all-in production cost for a chicken. Or a wheel of cheese or whatever. You know your retail price. And you know the minimum price you need to earn an acceptable profit. So, what wholesale price do you choose? That will depend on many factors, such as volume of purchases, frequency of purchases, whether they pick up or you deliver, payment terms and so on. You’ll also likely incur some additional costs you wouldn’t have otherwise, such as liability policies and certificate of insurance that name each retailer you deal with. And if you’re dealing with larger retailers such as Whole Foods, hell there were all kinds of compliance checklists, good manufacturing processes, HACCP plans, production records and all kinds of things we had to comply with every month. But if you’re selling directly to restaurants you likely won’t encounter those issues. So it’s much easier and cheaper to sell to restaurants, but, then again, they likely won’t buy as much volume from you. So, to simplify some of this since this could go on forever, figure you’ll likely be asked to give a 30% discount from the retail price. In that case you’d sell your $6.00 per pound chicken for $4.20 per pound. That’s a huge concession and you wouldn’t want to do that unless it was worth it to you. As you may recall, Paul and the Primal Pasture guys created a dedicated wholesale business called Pasturebird just to capitalize on the wholesale opportunity. That’s because the wholesale business is so different from the retail business, and Paul wanted to create a large pastured poultry brand. But you probably aren’t interested in that. You probably just want to sell to some restaurants—maybe a local co-op or retailer. In the restaurant example you need to look at another factor. What do they now pay for a similar product? Whether they buy from Sysco, Aramark or another food distributor, you’ll want to know what they’re paying now. Because they’re definitely paying less than retail. But—they’re very likely paying more than your minimum price, at least for a comparable product. So find out what they’re paying and arrive at a price that works for you. How? Ask. Don’t be afraid. Ask either someone who works at the restaurant or befriend someone. Hell, you’ve got like a billion friends on Facebook, right? One of them is bound to be a “real” friend who can help you. Okay, I’ve beat this issue up enough. I sold directly to customers for years, but also sold to restaurants along the way. As time went on I began selling directly to retailers such as Kroger and Earth Fare. Later, we we stopped focusing on pastured meats and instead focused only on farmstead cheese and kicked up production, I made a drastic change. I sold directly through a distributor, and only ONE distributor. And this comes around to a final point that you’ll want to consider. It’s tempting when you get the lure of big orders. When someone wants to buy 500 dozen eggs a week from you or whatnot and resell them. So you see the dollar signs, get excited about ramping up, start producing more eggs and then—well, you know the story. The buyer goes out of business or cancels the deal. And you—literally—had all your eggs in one basket. So there is definite risk on the wholesale side in that regard. There’s also risk in payment terms. I always got paid on delivery from restaurants—they wrote a check while I waited, and I required it. But I see many farms who say they struggle with getting timely payments from restaurants. So make sure you structure deals that protect you and your business. That’s what I did when I went 100% wholesale. It was part of an exclusive contract that guaranteed the distributor would purchase all the cheese I produced for a lengthy time period. And it wasn’t luck, it was just a mutually beneficial deal I negotiated. Did I get paid a lot less than my retail price? Hell yeah. But, I got to focus on making cheese and spending time with my family, while the distributor sent out trucks, picked up loads of cheese and dealt with all the retailers, resorts and restaurants. So there are times when wholesale makes sense. There are times when it may not. You’ll need to look at your own reasons. Hopefully this will help you determine whether you should do it and how to set your prices if you do. Coby and James, thanks for the questions. If you’d like to ask a question on the podcast, head to smallfarmnation.com/question. I’d love to hear from you.